Voicemail: Scooter Ross lets Mike and Mike know that the B.C. comic strip isn't being reprinted, but have new strips being drawn by his grandson, which leads to a long conversation about books, profits, and publishing's bottom lines. 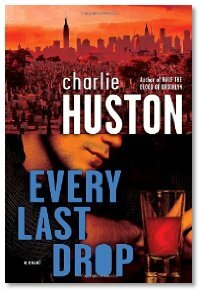 Interview: This week, Mike, Summer and Mike talk with Charlie Huston about Every Last Drop, the newest novel in his series about the vampire PI Joe Pitt, and the horror noir world he's created where vampires are born from contracting the Vyrus. Charlie tells us how Joe has ended up "in exile" in the Bronx and is trying to work his way back into enough good graces so he can go back to Manhattan without being killed; and how Joe starts getting closer to some of the most closely guarded secrets of the clans, all leading up to some explosive revelations in the planned 5th and final book in the series. Michael Crichton dies of cancer. but stackpole does not care, he is jealous of Michael Crichton and his literary skills. Um, you do realize that this show was recorded long before Nov 5th, when the news of Michael Crichton passing away was actually in the news? And that Crichton wasn't even mentioned in this episode at all? This isn't radio where what you hear is being simultaneously recorded and broadcast. You will hear them talk about Crichton in a future show. You are also more than welcome to call into the show and actually ask Stackpole directly, instead of hiding your grievance in website comments he likely will not read. And if my add, this episode went into the feed 2 days before Crichton passed. I don't generally insult people in comment areas, and I'm not going to start today, but boy was I tempted. bill siravo dies of ignorance. but stackpole doesnt care, he is jealous of bill siravo and his illiteracy skills. To say that Micheal is or was jealous of another person writing skills just does not hold water. If this was true, would the man go out of his way day in and day out doing a podcast on helping new writers learn the craft? Would he spend office hours in second life? Get behind ebooks and research readers to help new and upcoming writers, seeing what new trends and avenues that are opening up? The poster doesn't know Mike at all. And has some kind of grudge he is lashing out on, me thinks the jealousy lies at home here. Jenny, Darcy and myself have talked to Mike one on one in second life. He seems down to earth, approachable and has a great sense of humor. I think it it is safe to say that he morns the lost of a fellow writer as we all do. Everyone has a right to his or her feelings, thats one thing. Going over the top like this, save it for Howard Stern. Get to know a person, before you jump to unfounded conclusions. Since Mike is himself an award-winning and New York Times Bestselling Author (TM), and seeing how many projects he works on and how many conventions he's invited to year after year, I don't see how he has the time to be jealous of anyone. It's kind of the antithesis of being creative... if you're that focused on being angry about what someone else is doing, how can you get anything done yourself? And honestly, I don't recall him ever saying anything negative or derogatory about Crichton, ever. Maybe that some of his stories should be in SF, rather than mainstream lit (vague memory), but nothing that would have warranted Bill's reaction, and definitely not a word about him in this episode. I don't know how often people check the nav bars at the top of the page, but there is a Feedback Form to fill out, and that will send a note to Mike M, Mike S, Brian and myself. In the dropdown, there's a link that says "Contact the Dragon Page! ", and there's a form on that page that you can fill out, if you want to. I know some international listeners don't want to make international phone calls, so this could be an option for them. Just wanted to interject here and say I really really liked the interview with Charlie Huston. It was just a really nice honest straightforward look at a writer and how he does his job. He was a great guest. Nice job guys. Mr Stackpole is a really nice person. I have asked him several times about writing and his books, and he has always answered. And I am just a teen. I never read any of Mr Criton's books, but seen some of the movies and ER. Anytime anyone dies, it's a sad thing. I think everyone will miss him. He was a writer, and so he left behind a part of himself for us. That's what writers do, they have something inside that they let out and put on the page. It's like that with anything that is created, art, books, and movies. So how can one person be jealous of another person's talent? I don't get that. Talent isnt something you learn, it's something you are born with. Mr Stackpole is helping people take that talent, reconise it, and put it to work. Some people have talent they never use, ever. He is saying look, you have talent, you know you can write. This worked for me, maybe it will for you. And he is always telling guys in second life to write. That don't sound like a jealous person to me. A jealous person wouldn't share his or her secrets, they would keep that stuff to themselves. The person that wrote that above here, needs to get to know people before he says stuff like this. But he can say what he wants, its his right i guess. He's just not right in this case. Charlie's a great guy, and became a new entry on my "must check out new books" list after he'd done that in-studio interview with us back in 2007. Go to his website, and you'll see that Ballantine is giving away free ebook copies of his thrillers, starting with Caught Stealing. The second freebie is going to be made available sometime later in November. Be forwarned, Caught Stealing, not for the squeamish.